• Out of all the new malicious files detected in 2018, the amount that turned out to be backdoors rose by 44%, while the volume of ransomware increased by 43%. • One in three (30.01%) computers encountered at least one online malicious threat in 2018. 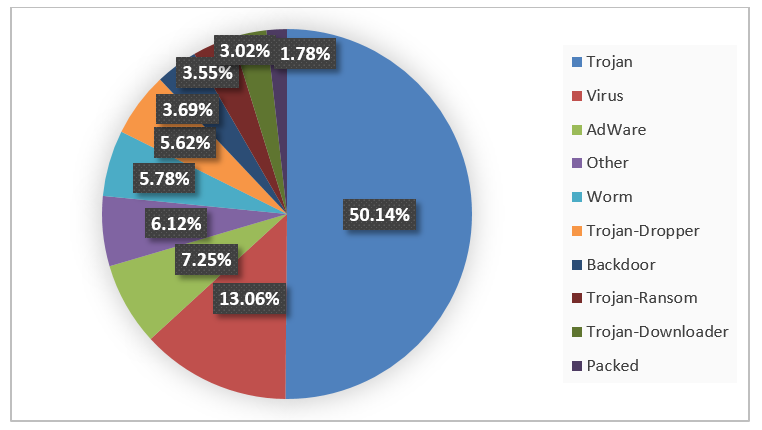 Taken together, these results show that malware, and backdoors and ransomware in particular remains significant risk for computer users. In 2018, ransomware (Trojan-Ransom) and backdoor detections comprised 3.5% and 3.7% of all new malicious files collected in the first ten months of the year. This represents a rise of 43% for ransomware (from 2,198,130 in 2017 to 3,133,513 in 2018) and 44% in backdoors (2,272,341 in 2017 to 3,263,681 in 2018) in comparison with the previous period. Share of new malicious file detections by behavior in 2018Overall, Kaspersky Lab’s detection technologies handled 346,000 new malicious files every day in the first ten months of the year. The number and range of new malicious files detected on a daily basis is a good indicator of the interests of cybercriminals involved in the creation and distribution of malware. In 2011, our technologies detected 70,000 new files a day, and by 2017, the number had risen five-fold to 360,000. “2018 saw a slight relief in daily detections. On the one hand, this could indicate criminals’ interest in reusing old malware that has proven efficient. On the other hand, the spikes in the number of backdoor and Trojan-Ransom detections show us that malicious actors are in constant search for new ways to compromise victims’ devices and make money out of them. The enduring interest in ransomware and its continued development is a warning to stay vigilant – both against existing, known cyberthreats and new, as yet unknown ones. This is why we continue to improve our detection and protection systems on a daily basis, making sure our customers are secure,” says Vyacheslav Zakorzhevsky, Head of Anti-Malware Research at Kaspersky Lab. Kaspersky Lab solutions repelled 1,876,998,691 attacks launched from online resources located all over the world. Kaspersky Lab’s web antivirus solution detected 21,643,946 unique malicious objects. 01% of user computers encountered an online malware attack at least once over the year. Pay close attention to, and don’t open any suspicious files or attachments received from unknown sources. Do not download and install applications from untrusted sources. Do not click on any links received from unknown sources and suspicious online advertisements. Create strong passwords and don’t forget to change them regularly. Always install updates. Some of them may contain critical security issues fixes. Ignore messages asking to disable security systems for Office software or antivirus software. Use a robust security solution appropriate to your system type and devices like Kaspersky Internet Security or Kaspersky Security Cloud. Read more about annual threat statistics on : Securelist.com. The statistics report is a part of the Kaspersky Security Bulletin 2018. To learn more about threat predictions for 2019, available here. Malicious cryptocurrency mining, and the review of the year are also available on Securelist.com.